Dans Tes Bras is a profoundly puzzling fragrance. And one of the most original launches of the year – there isn’t really much like it. Patty from the Perfume Posse calls it a shape-shifter, which sums up its structure pretty well. It does evolve, but not quite in a linear fashion: you could say it pulses around its Cashmeran structure (for an enlightening discussion on the theme, read Michelle Krell Kydd’s post on Glass Petal Smoke), with notes floating in and out for hours like wisps of mist before resolving themselves into the dry drown. Frédéric Malle and Maurice Roussel wanted to recreate the scent of warm skin. Whose skin? I’ve never smelled any like it. Maybe the skin of a sylph or a dryad? If skin smelled of wet black earth (like the best patchouli). Of green violet leaves. Of tingling bergamot. Of the powdery veil of amyl salicylate – a molecule used to impart freshness to floral fragrances ever since L.T. Piver’s 1898 Le Trèfle Incarnat – combining with metallic violets. If skin exuded the green minty puff of methyl salicylate, like a ghostly echo of tuberose divested of its floral notes. If skin had the cool-burning flavor of cloves and tasted of carnations blended in almondy-anisic heliotrope… If skin were bathed in incense. Though described by Osmoz as a"slightly retro" – and indeed, a hint of Worth’s original Je Reviens, of Coty’s L’Origan, of Guerlain’s L’Heure Bleue or Après l’Ondée can be teased out if you concentrate – Maurice Roucel’s Dans Tes Bras is so out there that it barely registers as a personal fragrances. Bloggers like the French Ambre Gris, and several commenters on French for a, who have been able to smell it since its launch in early September, were repulsed by its “mushroom cellar” dankness ( what if this were how pod people smell?). Wet earth reeks with the intimation of death, the final embrace; its greenness is that of vegetation springing from decomposed matter. But then the warm, salty woodiness of Cashmeran kicks in, and Dans Tes Bras pulls living human flesh out of its vegetal cradle: but this is flesh without gender (at the Malle boutique, S.A.s say women find it too masculine, probably because Cashmeran is usually incorporated to men’s fragrances, and men find too feminine, possibly because of the powdery heliotropin). I’d promised myself I would write another review of Dans Tes Bras once I got a chance to properly wear it – the first post was merely a preview based on a cardboard sample. I’m still no nearer to feeling any familiarity with it, or rather: to taming its low-key otherness. It does smell familiar. But not like anything I’ve met in a bottle. 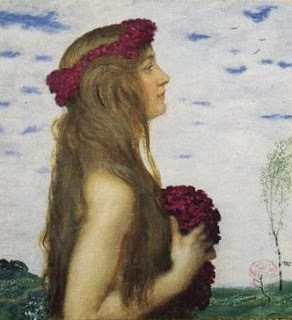 Image: Franz von Stuck, Spring, found on the Femme, Femme, Femme blog. I smelled this in early October (on my skin). There was a tester at Barneys in BH. The top notes seemed very astringent to me, but the drydown is fabulous. It also has good staying power. In addition I was given a sprayed card and I could still smell the dry down 10 days later. I need to get a sample, because that day I had tried other perfumes, and my senses were in overload. Hello Arwen. I found the bergamot quite tingly but on me it evaporated rather quickly. It's quite tenacious but rather low on sillage (you're right, it stays forever on cardboard). I think this is definitely a fragrance that must be smelled solo. I've worn it several times and though I find it beautiful, I'm still a little baffled by it. Wow! Strange to read your (excellent) review of this perfume today. I'm in London, tested this perfume, among others, at Liberty today,just for curiosity. But it is far the most interesting among the ones I tried. (this verdict is probably also informed by what I have read about this perfume). On Scented Salamander that I read just now it is said that it feels like a fragrance a character from Blade Runner could wear. What a coincidence that the film I saw together with my dearest the night before traveling her was the director's cut of Blade Runner. I experience the mushroom quite strongly in the beginning, but even the mushrooms are transformed by the casmerian to something bearable, if not nice..
Stella mentions Alien as an example of a retrofuturistic perfume and I believe she was referring to not only its name but also the fragrance itself, in which case I'd totally agree with her categorization seeing as Alien, which I adore btw, to my nose smells absolutely extraterrestrial. And isn't it also built around cashmeran? Hi Stella. I already used up the Blade Runner angle in my review of Bulgari Black some months back, calling it "Shalimar for replicants". You're pretty much on the money calling those violets retrofuturistic -- in themselves, they should be old-fashioned, but they're not, because there's practically no candied sweetness in there: I think the wet earth violet leaf/patchouli combo pulls them away from that. If we're talking science-fiction, Dans Tes Bras might the Victorian alternate universe cooked up by William Gibson and Bruce Sterling in "The Difference Engine" -- a prime example of the steampunk genre. But I'm still holding out for the flesh of the pod people in "Invasion of the Body Snatchers". Dusan, I'm sure Chris Sheldrake is no Grenouille (he's way too attractive and well-spoken a man for that), and if Serge Lutens is anything, he is a child of the night (just don't tell Buffy). I haven't had a proper sniff at Alien (Angel scared me off Thierry Mugler forever -- and to think I used to wear his designs!). But Dans Tes Bras is certainly original enough to warrant exploration. Stella, I have a soft spot for Philip Kaufman's version, because of Donald Sutherland (my compatriot -- and he even once came up to speak to me getting off a flight from Montreal because of the book I was reading! swoon). Getting back to fragrance, I think Cashmeran is treated in a very peculiar way in Dans Tes Bras -- it takes it into another realm. Michell Krell Kydd's post in Glass Petal Smoke makes some very enlightening comments on the structure, based on an interview she did of Frédéric Malle. Thank you for the reference, I will find it! Kaufman's version is very good! But still my favorite among them, if I must chose is Don Siegel's from 56..
Has anyone made a comparison between Dans Tes Bras and L'Artisan's Verte Violette? I wear this from time to time and I have always thought of it as a better than skin, skin smell. Last week I tried Dans Tes Bras and it sent me rushing to find my bottle of VV. Stella, the book I was reading was Kenneth Clark's (the British art historian, not the politician!) "Civilization", actually the text of a groundbreaking 70s mini-series on the greatest artistic achievements of Western culture. You know, the weirdest is, we were waiting for our luggage, I alone, he we his wife and youngest children. I sat and pulled out the book, with the absolute certainty that he would come to talk to me about it. The only thing I regret is not having told him about that certainty. But after an all-nighter flight in the cattle class, my brain wasn't really on straight! Alexander, I've never tried Verte Violette by Anne Flipo. The feeling I get from reading the reviews is that VV may feature a much sweeter, classic violet than DTB. But I'll seek it out next chance I pass by a L'Artisan counter. I got a sample of this recently and am trying to wrap my head around it! Your review definately is really helpful. I'd love to smell this on a man. On me, however, it explodes into a bizarre metallic mushroom affair when I spritz. It makes me really curious to try it on others. Aimée, lots of people get mushroom, which I can just about "see" if I squint my nostrils in a certain angle... Is it because of the damp earth smell or is it the shiitaké kind of mushroom you get from some gardenias, like Tom Ford's? The metallic facet almost certainly comes from the ionones for the violet. I'd love to smell it on a man too. No guinea pig handy, alas. Oh, I'm sure you're right, it's the ionones that just take over my nose and I can't smell anything else about it. I'm going to try it again to see if greater familiarity with it balances those pesky over-excited violet molecules. I can get with the mushroomy -- *that's* no problem, and didn't mean to imply that I don't like undergrowth scents. That part I would probably find very endearing. Aimée, normally after a while, there's an anosmia to ionones, so the violet attack should subside. Hello, D. So, as I mentioned on POL, I happened to stop by the Barney's in Boston just after lunch this week. As it turns out, bottles of Dans Tes Bras had just arrived in the store, AND Frédéric Malle was on-hand to give a training to the SAs. As the training was just finishing up, I was able to meet him, and we had a very nice conversation about Dans Tes Bras. He confirmed my sense of Dans Tes Bras as being related to both L'Eau D'Hiver and Une Fleur de Cassie, and also that "there was a good amount of Après L'Ondée present" in both Dans Tes Bras and L'Eau D'Hiver (and Une Fleur de Cassie, for that matter). 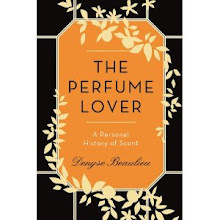 I told him how much appreciated this sense that the fragrances in his line are not only nice smelling things (which they are), but they are in a sort of dialogue with the fragrances that came before, all the way back to things like Après L'Ondée. So the violet and heliotrope in Dans Tes Bras immediately references Après L'Ondée for me, though the clove note also reminds me of Coty's L'Origan. 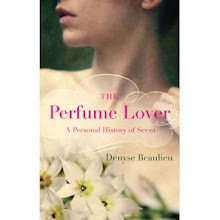 I think it's fascinating to think of perfumes and perfumers as being in a sort of dialogue. Or that, as in any art, perfumers are artists who are often reworking classical structures -- deconstructing, reconstructing, synthesizing. Part of perfumers' training is to endlessly de-construct and reconstruct classics, using just their nose as a reference. So, given the time and liberty to do it, it seems normal that they would engage in that form of dialogue, as do artists in other fields -- especially since our epoch is very "referentialist" artistically. The L'Origan filiation (carnation/clove-orange blossom-heliotrope) can be traced in a whole fragrance family. It is less obvious in Dans Tes Bras, but there's a bit of the DNA knocking about in there, definitely. I know it's late in the game, but I remember reading this review a while back. I was at the Malle counter in New York City this weekend and wanted to familiarize myself with the line, having never smelled it before. I was sure Vetiver Extraordinaire was going to be the one for me. After smelling the lineup of "men's" fragrances, Dans tes bras was the one I settled on. This really surprised me, though I am a fan of the weird and unusual, so not too much. Still, I chose it because it was like nothing else I had smelled, let alone owned. This alone was the standout unique one among the 8 or so I smelled. I am so glad I bought a bottle- I eagerly look forward to living with this creature in the days to come! Jared, isn't it the strangest scent? I find it quite fascinating, and one of the most original releases of the past couple of years.